Artist's illustration of a Breakthrough Starshot sailcraft flying by the potentially habitable exoplanet Proxima b. Giant lasers may indeed launch fleets of spacecraft to Alpha Centauri, given breakthroughs in the science behind extraordinarily thin, incredibly reflective sails that can catch this laser light, a new study finds. 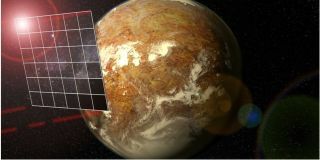 The $100 million Breakthrough Starshot initiative, which was announced in 2016, plans to use powerful lasers to launch swarms of tiny spacecraft to Alpha Centauri, the closest star system to our own. While using laser cannons for spacecraft propulsion might sound like science fiction, previous research has suggested that "light sailing" might be one of the only technically feasible ways to get a probe to another star within a human lifetime. Conventional rockets are nowhere near efficient enough to cover the enormous distance to Alpha Centauri within a human lifetime. For instance, it would take NASA's Voyager 1 spacecraft — which launched in 1977 and reached interstellar space in 2012 — about 75,000 years to reach Alpha Centauri (if the probe were headed in the right direction, and it's not). The problem with all thrusters that current spacecraft use for propulsion is that the propellant they carry with them has mass. Long trips need a lot of propellant, which makes the thrusters heavy, which, in turn, requires more propellant, making them heavier, and so on. And that problem gets exponentially worse the bigger a spacecraft gets. Starshot proposes that, instead of carrying propellant for propulsion, spacecraft be equipped with mirror-like sails and rely on lasers to push these probes outward. "It's a really audacious goal," study lead author Harry Atwater, a materials scientist and applied physicist at the California Institute of Technology in Pasadena, told Space.com. Although light does not exert much pressure, previous work has shown that sunlight can be used for spaceflight. Japan's IKAROS (Interplanetary Kite-craft Accelerated by Radiation of the Sun) mission, which launched in 2010, was the first spacecraft to successfully demonstrate solar sail technology in interplanetary space, reaching a maximum velocity of about 895 mph (1,440 km/h). Starshot aims to launch microchip-size spacecraft toward Alpha Centauri using an Earth-based laser array as powerful as 100 gigawatts. "This will by far be the largest laser humanity has ever constructed," Atwater said. The "StarChips" would fly at up to 20 percent the speed of light and reach Alpha Centauri in roughly 20 years, each using a 1-watt laser and its sail to communicate with Earth. Starshot aims to launch up to tens of thousands of StarChips per year. So the hope is that, even if many fail, many others will reach the distant system — and perhaps get an up-close look at Proxima b, a potentially habitable planet circling one of the system's three stars. The sail for each StarChip is designed with a size of about 108 square feet (10 square meters) and a mass of less than 1 gram, meaning that it should be only about 100 atoms thick, according to the new study, which was published onlinetoday (May 7) in the journal Nature Materials. Creating a sail that's reflective, light and strong enough to make the journey to Alpha Centauri is a challenge that pushes the boundaries of existing science, the researchers noted. The Starshot laser array will likely fire beams of specific wavelengths of near-infrared light to which Earth's atmosphere is transparent. Starshot sails need to not only reflect these wavelengths but at best absorb only a tiny amount of their energy, lest they heat up and get destroyed when hit with Starshot's extraordinarily intense lasers. Moreover, the sails must be light and thin enough to get pushed as strongly as possible by lasers. In addition, much as how an ambulance siren sounds higher-pitched as the vehicle drives toward you and lower-pitched as it moves away, as the sails get farther away from the lasers, the light they receive will redden in a process called Doppler shift. Ideally, the sails should also reflect these redder wavelengths to get as much propulsion as possible from the laser beams, the researchers explained. The scientists found that no known material possesses the perfect combination of properties to serve as Starshot sails. For instance, although metals such as gold and silver are excellent reflectors of near-infrared light, they would absorb too much energy from Starshot's lasers to survive. Still, a number of materials have at least some of the required qualities, suggesting that they could serve as Starshot sails. These include crystalline silicon and molybdenum disulfide. As far as finding a sail that reflects as much light as possible while staying low in mass, the scientists recommended sails with hexagonal lattices of holes to reduce their weight. The researchers also noted that controlling the microscopic structure of the sail — such as by using alternating layers of material, each only nanometers (billionths of a meter) thick — could boost its reflectivity and reduce its absorptivity. At the extraordinarily high speeds at which the StarChips will travel, even tiny impacts could potentially destroy these probes. Still, prior work has suggested that hydrogen and helium molecules may pass through the sails without resulting in such effects. In addition, although previous research suggested that each sail might encounter about a billion dust particles on the way to Alpha Centauri, such impacts would likely punch holes amounting to less than 0.1 percent of the collective sail area. Future challenges include exploring how various materials perform when subjected to powerful lasers and incredibly high rates of acceleration. Moreover, scientists have to investigate how to fabricate and handle large sheets of extremely thin films and how to assemble such delicate components together into a sail, the researchers said. "There will definitely be fabrication challenges, but nothing out of the realm of possibility," Atwater said. "These are real materials, not 'unobtanium.'" In addition, further research should explore how the shape of the sail and the footprint of the laser beam on the sail may help improve how stably it flies through space. For instance, scientists may investigate spherical sails and doughnut-shaped beams. "If you think about a leaf blower, it can blow a leaf along efficiently until it's pushed out of the stream of air, at which point it moves unstably," Atwater said. "The light pressure pushing these sails faces the same problem. We have to design the sails and the array in a way so the sails can ride stably on the beam. "We face exciting problems," Atwater added. "But we think there are solutions."